The event will feature a Silent Auction from 5:30-6:00 PM, a Live Auction from 6:00-7:00 PM and the option to purchase refreshments and other goodies! Pizza will be available for only $2 per slice. Bring the whole family and give mom a night off from cooking and top it with a fabulous dessert. 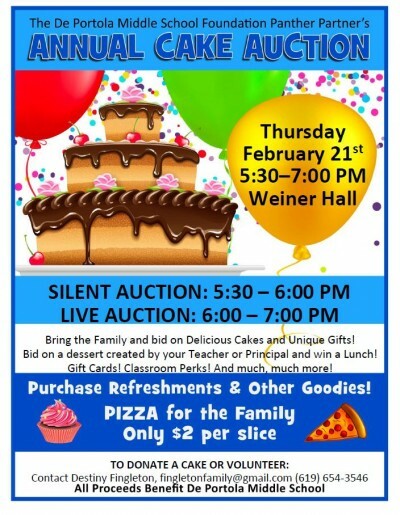 You and your family will have a chance to bid on delicious cakes and unique gifts including dessert created by our favorite De Portola teachers and faculty! There are classroom perks available, a chance to win a lunch, obtain gift cards attached to some of the yummy cakes and more! All proceeds will benefit De Portola Middle School.